Vampisoul’s Discos Fuentes reissue series continues with this dancefloor filler. 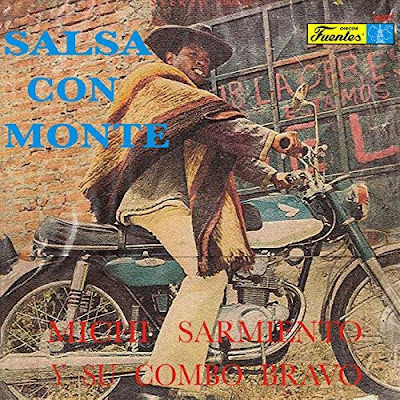 Michi Sarmiento is part of the Discos Fuentes family: his father Climaco was an in-house arranger there after playing in Lucho Bermudez’s legendary porro orchestra. Michi came up in the 60s, when the Colombian music scene was being heavily impacted by Latin music from Puerto Rico and New York City: bugalu, descarga and the early elements of what we now know as salsa. That’s what DJs were spinning and dancers were moving to, so Michi made a point of adding it to his band’s repertoire of cumbia, merecumbe, gaita and all the other Afro-Colombian sounds of his hometown of Cartagena. This 1973 album, Combo Bravo’s sixth, is a great example of how diverse a working band had to be back then – practically every song is in a different rhythm. Highlights include a Nuyorican-flavored guaguanco (2), a swinging calypso (4), a Cuban-style rumba (7), a hot descarga with the full NYC sound (8), and a Puerto Rican bomba-plena that’s been turned into Dominican merengue. It’s easy to see why these guys were popular – they could keep the dancers going all night.